When we want to shop the latest shoe trends before everyone else, one of the first places we think to check is Shopbop. As you probably already know, they stock only the most stylish options from brands at a variety of price points and are one of the few places where you could feasibly get all of your shopping done for the season in one place. Since we know that you're already major fans of the e-tailer, we went straight to the source to get their expert opinion on the shoe style that everyone is already buying (and will continue to do so) in 2017. Shopbop's fashion director Caroline Maguire told us that the embellished slide is the shoe of the season, and being huge fans of the effortless shoe trend ourselves, we couldn't be more pleased to hear this. Maguire said, "Our girl has already mastered the slide, it's a staple in her closet by now. She's ready for the season's new take on this style—loads of embellishment, novelty, and texture, fringe and frills—all reasons to buy!" 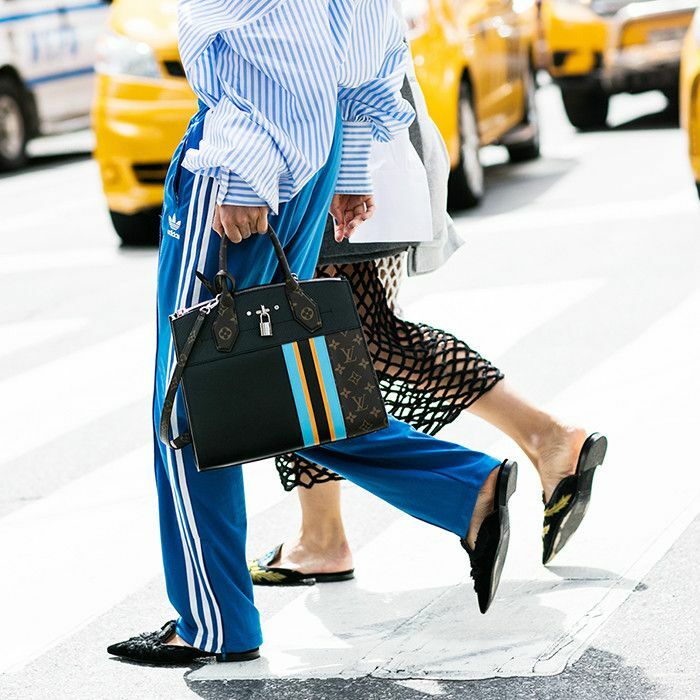 We, too, have noticed that the pretty shoe style has been taking off, as they were a mainstay on directional fashion week attendees' feet this past September and October, and the best pairs across the internet have already been quickly selling out. Although you might have to wait a few months to wear them if you live in a colder climate, we strongly advise shopping the trend now because of the sellout factor. Keep scrolling to shop Maguire's embellished slide picks and a few more that we find incredibly stylish and splurge-worthy. Consider these an investment that you'll wear all the time. A sleek silver band at the toe elevates these even more. Oversize buckles is a micro trend that's gaining serious steam. Pink and silver are a dreamy pair. Fashion insiders are obsessed with these Alberta Ferretti mules right now. Another season, another pair of obsession-worthy Acne Studios shoes. This is how to wear velvet once the weather warms up. Prediction: These will garner a lengthy waiting list. Studs add a touch of edge to this elegant shoe. Your feet will thank you for these. These are fancy enough to wear out at night. You can't go wrong with this whimsical neutral option. Wear these like a street style star by pairing them with vintage jeans and a graphic tee. Proof that sequins can be quite sophisticated. This will be your go-to pair for spring and summer weekends to come. For more shoe updates, see the unlikely trend that is set to be huge this Spring. Just as the Olsens.